Hang on, did your dog just wink at you? Unusual winking, blinking, rubbing, or pawing at the eyes is your pet's way of telling you there may be something wrong. Eye infections in dogs are common and very serious. There are a few dog eye infection treatments and preventatives available. Eye infections in dogs occur when the eyes react to invasion from harmful micro-organisms; these could be bacteria, viruses or even fungi among others. Microorganisms can invade all parts of the dog's eye. The best thing you can do is to prevent this invasion in the first place. But they are also easily eradicated and will cause no permanent damage if action is taken quickly. Here's what you should know about dog eye infection problems, how to prevent them and what treatments are available over the counter and through your veterinarian. How Serious Eye Infections Are? Because there are many different diseases and eye infections in dogs that share very similar symptoms, it's difficult to assess the seriousness of the problem before establishing which type of infection it is. Until you know what you are actually dealing with, you won’t know how to treat the problem, never mind how serious it is. If you notice something is wrong with your dog’s eyes, you should schedule an appointment with your veterinarian. The one thing that all dog eye infection issues have in common is that no matter how bad they might ultimately be, early treatment is almost guaranteed to relieve your dog's suffering quickly and may even save his sight. Almost all dogs can get various infections to their eyes. And although we might adore our purebred dogs and their unique characteristics or traits, here we find that selective breeding has not only created the good, but it has also let in some of the bad. To breed for a particular type or to keep the breed’s lineage ‘pure,' breeders have had to select dogs from the same small gene pool. While this has increased the qualities breeders want, it has also led to some predispositions or genetic defects to occur, including dog eye infection problems and other issues related to sight. These dogs are more prone to Cherry Eye, a problem of the third eyelid, or tear gland; luckily this is repairable with surgery or in some cases with dog eye drops and massage. Pretty little Shelties, Lassie lookalikes and boisterous Border Collies are prone to what is called Collie Eye Anomaly (CEA). This is a genetic condition that impacts the retina, choroid, and sclera with varying degrees of severity from being so mild it doesn’t affect the vision, to severe enough that would lead to dog's blindness. This high-spirited tail wagging dynamo might be the ideal sniffer dog, but unfortunately, his eyes are not quite as good as his nose. Prone to Progressive Retinal Atrophy (PRA), glaucoma and cataracts. Be on the lookout for common dog eye infection symptoms such as itchy eyes, cloudiness, or redness. Out of all dog breeds, GSDs are the most prone to suffer from Pannus, otherwise known as Chronic Superficial Keratitis (CSK). This is an affliction whereby the dog’s body suddenly treats the cornea as a foreign object, and although incurable, its progression can be managed. Marmaduke didn’t seem to have a problem with his eyes, but Great Danes are prone to a type of dog eye infection called Entropion. This is a hereditary disorder where the eyelid rolls inwards causing the eyelashes to irritate the eye. It's a painful condition for the dog which can be remedied by surgery. Poodles are predisposed to suffer from Glaucoma. This is a condition where there is a buildup of fluid in the eye which causes pressure, pain and if not treated early enough, eventual blindness in the dog. Although eye infections in dogs are fairly common, the symptoms for them are shared by many more ominous conditions. It's best to spend a few moments each day gazing into your fur baby's eyes, that way you will be able to identify any changes and treat them at the first opportunity. Most dogs have some form of discharge like eye boogers from their eye at some time or another. Eye discharge generally becomes a problem when it’s excessive, watery or pus-like. It can be caused by allergies, some diseases, a foreign object, or acute case of eye infections in dogs. Not all dogs long for the bright lights of Broadway, but a healthy dog shouldn’t try to avoid bright lights. Light sensitivity is fairly common when your dog is suffering from irritation to its cornea, but there are lots of reasons for your dog to suddenly avoid the light, so the sooner you get it checked out, the better. You have to be quite observant to notice this symptom, but just like us, when your pal gets something in his eye, his natural reaction is to blink it out. The problem is, it might not be a foreign object he’s been irritated by, often there can be other explanations including corneal damage, so best get yourselves off to the vet. If possible, gently bandage the eye to avoid further irritation caused by the excessive blinking. The partial opening of one eye is an obvious sign that there is something wrong. Remember even the smallest injury can turn into an infected wound, so don’t expect the problem to go away on its own. You can examine for a foreign object, but the only kind that is safe to handle at home is one where it’s an obvious object and can be flushed out with a saline solution. All other causes really are best examined by your trusty vet. There are many ways for your dog to contract an eye infection. As discussed above, some breeds are more prone to them than others, and some are just unlucky. Furthermore, new studies have been recently discovering even more risks for dog eyes, such as new dog eye parasites or other related diseases that were previously unknown. A study in 2016 was focusing on the mysterious disease related to dog eye infection issues called Sudden Acquired Retinal Degeneration Syndrome (SARDS). This was previously known to vets and pet parents, but we still unsure of its causes and even proper treatments. A study in 2017 found that eye infections in dogs can also be caused by newly appearing parasites, and treatments for these can also be complicated. Superficial infection mucocutaneous on the eye of a dog. Once again, regardless of the causes, prompt treatment for eye infections in dogs is essential. If you failed to prevent any of these eye problems, then taking your dog to the vet immediately is crucial – dog eye infections may become chronic or cause lasting damage if you don't attend to them right away. How many times have you heard that prevention is better than cure? In the case of dog eye infection issues, this is more true than ever. There are several dog eye care products you can use as treatments or as preventatives. Preventing eye infections in dogs is not always 100% possible; sometimes your dog might come into contact with another dog suffering from an infection, or he might get something in his eye that has bacteria on it, but there is still a few things you can do. A good old eye to eye chat with your dog is a good idea every morning. Become familiar with what your Fido's healthy eyes look like so that you will notice anything untoward happening. When you and your furbaby go on road trips together, keep the windows closed – seeds, dust and all sorts of debris, bits and bobs can fly into your dog's eyes. No more hanging his head out the window with the wind blowing through his fur if you want to avoid all types of eye problems. Keep your pooch's face clean. Simply get a few washcloths that are specifically your dog's and make it a fun routine. Use warm water in the winter and cool water in the summer to make him feel really pampered. You don’t need to go so far as a full-on shave but keeping the hair around your dog's eyes nice and short can stop the hair from scratching his cornea which can let infection in (here's how to do it). Or depending on the length of his coat – maybe buy some scrunchies and tie that hair up. I know the easiest thing to do is throw in the cheapest sack of dog food at the supermarket, but a little bit of thought and investment will be worthwhile down the road. Your dog needs to be firing on all cylinders to maintain a strong and active immune system to fight off any type of dog eye infection problems. Prevention is better than cure, and keeping an eye on your dog's eyes can go a long way in saving you the trouble, time and money when it comes to treatment of dog eye infections. Some homemade poultices can be real first aid standbys, but most vets generally do not recommend them due to lack of evidence for their effectiveness. That said, even if your dog is on medication, check with your vet to see if you can supplement with some herbal recipes. Obviously, you don’t want to dilute an essential medication, but the soothing, healing powers of herbs are undeniable, according to holistic vets. These can work well for minor issues, but you should see your vet if the condition worsens or persists. There are several types of eye drops for dogs, but a saline solution is a good place to start. It is made up of 1 cup of lukewarm water with ¼ tsp of salt added. This can be used as a wipe, helping to remove crusty discharge, always wiping from the inside of the eye out, and never reusing the same wipe twice. You can also use this as a flush, dripping a small amount into your dog’s eye using a sterile eye dropper or new cotton ball. We prefer to err on the side of caution as pet parents, so check with our vet before you introduce a new herbal supplement. All it takes is a quick phone call to get the all clear. A favorite of many pet owners is the chamomile tea. Get some of it – one for your dog and one for yourself. Although I drink mine from a cup and saucer and my dog gets the tea bag resting on his sore eye, suitably cooled of course. When you’re looking for astringency, anti-inflammatory, and antiseptic qualities, Meadowsweet is a great addition to your toolkit. Also known as Filipendula Ulmaria. Be very cautious not to let your cat anywhere near this as if ingested it can cause kidney failure and even death from salicylate intoxication which occurs from their inability to metabolize the herb correctly. Here again, Eyebright has the qualities of astringent, anti-inflammatory and antiseptic qualities in an easily obtained herb. This is generally a fast acting, but short-lived remedy. Also known as Euphrasia Officinalis. When it comes to removing unwanted substances, Burdock herb is a champ, according to holistic veterinarians, and an infection is definitely an unwanted substance. Also known as Arctium lappa, you can ask your vet where to buy it. Not just good for cooking, Rosemary herb is well-known for pain relief and is often recommended by alternative health practitioners instead of regular pain relief meds. It's also called Rosmarinus Officinalis. Just remember that because the above are alternative health methods, natural and holistic home remedies for dog eye infection problems, they have not been scientifically tested or proven to be effective. It's best to consult with your veterinarian and closely monitor your pet's condition when using these treatments. RELATED: Angel Eyes for Dogs Review – Is It Safe for Pets? Dogs being dogs, they are bound to run into problems now and then, and dog eye infection problems are relatively common for pet owners to encounter. But don’t let this make you complacent; eye infections have the same symptoms as more serious ailments, and serious damage to the eye can occur very quickly. This is why most vets recommend bringing your dog in within 24 hours if you notice a problem with the eye. If you examine your dog’s eye and can clearly see a foreign body that you can safely remove, it is probably safe to do so, otherwise, leave the exam to the vet. He will probably want to take your dog's temperature. First, this is to check for general good health and sign of an infection. Next, the vet will get out his trusty ophthalmoscope and look into your dog’s eyes for tumors, foreign bodies and any abnormalities. He will note the general health of the eye, including any redness or swelling, any discharge or unusual eye activity. This amazing test will show your vet if there are any scratches or ulcers on your dog’s eye. All he does, is take a chemically treated strip of paper, place it on your dog’s eye, and any problems show up as green, thanks to the chemical Fluorescein. This one says it all in the name; it’s a straightforward and quick test to measure the tear production in your dog’s eye. Your vet will soon be able to tell if little Fido is producing an average amount of tears or too much or too little thanks to an infection. Your vet, with his vast experience, is very much used to diagnosing any problems your pet might have, he’s got some pretty fancy tools and labs to help as well. Whatever it is that is happening with your dog’s eye, he will have seen before and know a very efficient way to treat it. Follow his advice to the letter, and before you know it, you and old Poochy McPoochyface will be out on the trails again in no time. Antibacterial. Most common and most effective treatment for dog eye infections. It's available over-the-counter and with vet prescription (depending on strength and type). Affordable. Best to use for dog's weeping eyes or other insignificant issues. Steroid. It's the strongest treatment for eye infections in dogs, and it's by veterinary prescription only. Commonly used for serious eye inflammations and other more related problems. Often used in conjunction with antibiotics for best results. Petroleum/lubricant. The simplest solution, dog eye wash/drops type used for dogs with infected eyes or eye inflammation. It's available over-the-counter, and generally helps with relieving dryness and itchiness. All steroid products must be prescribed by your veterinarian. You cannot (and shouldn't) purchase any steroid products over the counter due to their strength and possible side effects. Neo Poly Dex Ophthalmic. Antibiotic + Steroid. Ader Enterprises Pet Vision Pro. Antibiotic. Tomlyn Sterile Eye Wash. One of the more popular dog eye washes to buy over the counter, this one relieves discomfort and itching caused by environmental pollutants. It has the same pH level as dog's tears to avoid any further irritation. Burt’s Bees Eye Wash Solution. Saline solution mimicking tears; used for cleaning dog’s eyes. Like majority of Burt's Bees products, this is a calming and soothing product made with minimal amount of chemicals; not irritating, pH balanced with natural ingredients. The saline solution will help to remove all the debris from the dog's eyes. 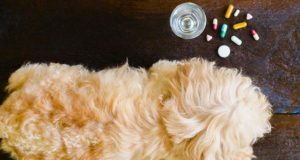 While you can buy certain antibiotic dog eye infection treatments, it's best to consult with a veterinarian first to choose a plan of action on how you're going to treat your pooch and which products to be used. Eyes are very sensitive and it's crucial to avoid mistakes. Once again, remember that the above methods of assisting dog eye infection treatment through diet have no scientific evidence to prove whether they work or not. Be cautious, and consult with your veterinarian before changing your pet's diet. Dog eye infections are often confused with a number of other eye problems in dogs. 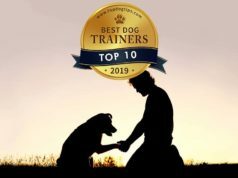 Below are some of the most common ones you must know, including their symptoms so that you can distinguish which condition your pooch is closer to. When it comes to the health of your dog’s eye, it’s not worth leaving to chance. For that reason, it's highly recommended that whenever you suspect dog eye infection problems, visit your veterinarian as soon as you notice something is amiss. With many dog eye infection home remedies and medical treatments available, problems with the eye can resolve quickly and leave no lasting problem. But if left untreated for too long, permanent damage can happen to the dog's eye and even result in loss of vision.